MiniLab is a USB bus-powered powerhouse, featuring 25 velocity-sensitive mini-keys alongside brand-new pitch and modulation touch-strip controls for maximising musical expression in a highly-portable package. 16 multifunction encoders — more than those found on any available comparably-sized USB/MIDI controller — ensure everything is at hand to program or perform, wherever life may take or lead you. And if that's not enough to keep users entertained, two banks of brightly backlit performance pads can be easily assigned as pads, MIDI CC buttons, or program change switches for even speedier interactions with whatever device MiniLab is connected to (via its cleverly-recessed USB bus-power port and sustain pedal input). Of course, music is where the heart is, and at the heart of MiniLab is the benevolently bundled Analog Lab software solution. With over 5,000 legendary classic keyboard and synth sounds carefully chosen from the Mini V, Modular V, CS-80 V, ARP2600 V, Jupiter-8V, Prophet 5, Prophet VS, Oberheim SEM V, and Wurlitzer V range of Analog Classic software instruments, Analog Lab offers speedy and simple editing with the most essential parameters for personalising presets available onscreen and for tweaking using the MiniLab controls. Notably, those TAE® (True Analog Emulation) synthesis-powered sounds are not sample-based, but are actually running the full synth engine behind the scenes, so offer unparalleled flexibility. Yet there's more: owners of those individual Analog Classics or the all-encompassing V Collection 3.0 bundle can open an Analog Lab sound, edit it in the original software instrument, then add it to their Analog Lab library, thereby taking their sound and workflow to a higher state of musical interactivity. Speaking of which, MiniLab is also compatible with Apple iPad and iPhone products (using a camera connection kit). So, whatever way users choose to use it, musical life on the move's just got a whole lot sweeter thanks to MiniLab, the world's premier mobile keyboard solution! 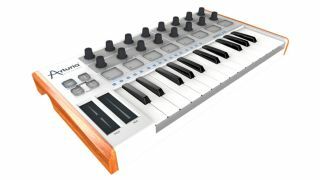 MiniLab will be available to purchase from the Arturia online store (http://www.arturia.com/evolution/en/buy/online-shop.html) or any dealer for €99.00 EURO/$129.00 USD from mid-March 2013.